Patience is not a virtue of mine. I hate waiting. I realize it is a necessary part of the publishing process, but oh, how I dislike doing nothing. So I don’t. I find other ways to stay busy. Last month, I nervously waited for beta readers to get back to me with their comments. I started outlining follow-up projects and writing a few placeholder scenes, but I didn’t want to go too far away from my current project, just in case another round of major revisions was needed. I didn’t want to lose my sense of the characters or the story’s timing. So instead of jumping fully into my next project, I spent some of that time creating covers for my manuscript. It may sound like I was procrastinating, but it makes the work feel more real and seeing a cover, even a fake one, helps keep me motivated to push through bouts of writer’s block. The mock-up process also helps me with the project’s final development even if I ultimately don’t use any of my creations. For example, if the title doesn’t look good on a cover, I consider changing it altogether, not just the placement. If the back blurb doesn’t stand out, I refine it. Additionally, my designs help me focus my elevator speech and discuss must have elements with graphic/interior artists. As useful as my mock-ups are, I usually don’t share my actual graphic designs with anyone except the hubby who has been trained to smile and say, “nice work,” even if he is thinking please don’t quit your day job. Only this time he said, “you might have something.” I tinkered with it some more, and then some more until I realized I agreed with him. Feeling proud, I showed the cover design to my younger sister over the weekend. “Hmm, it looks nice,” she said with a shrug before returning her attention to something else. Publishing a book is easy. All you have to do is hit the Publish button on any number of publishing sites like Smashwords, Kindle Direct, CreateSpace, Lulu, etc, but pushing that button yourself is hard, really hard. One of the reasons the traditional publishing route is so appealing in the face of lower royalties and smaller advances is because other people are helping you push that button. You get instant street cred. You get to feel shiny and validated. That is until the first negative review comes in. Then you start questioning your work (and worth) as much as the self-published author, but at least the self-published author has the power to make quick changes if needed. The key is to trust your gut and always remember your audience. While my sister reads often, she is not what anyone would describe as a book nerd. I trust her to tell me when something I do is terrible, but sometimes her polite indifference is as glowing of an endorsement as I am ever going to get. 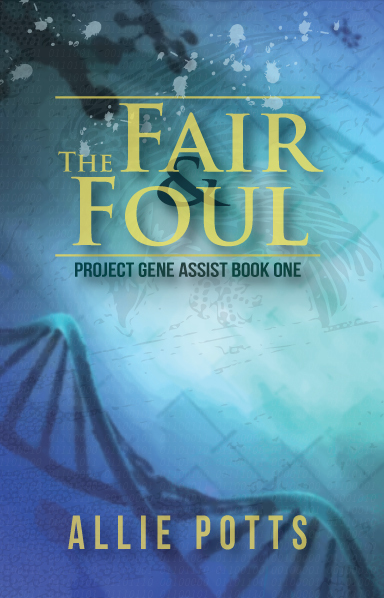 Therefore, without further ado, I would like to reveal my cover (or at least the title) of my second novel – The Fair & Foul: Project Gene Assist Book One. I am intrigued. It looks like a fantastic DNA strain, very dreamlike. I know this is not my usual genre to read but definitely looking forward to reading the published work! And it will be published. One way or another. I’ve officially notified the public, so now it is a question of when rather than if. We (my designer and I) had a miserable time figuring out a cover for my last book and then once we decided it got rejected by the publisher as did the title and it was back to the drawing board. I’m impressed with your design! Were it me, I’d put a pop of some other color – perhaps in the subtitle? Best of luck pushing that button! It isn’t easy! You were right, using another color for the text really makes it stand out. Shew! I am glad you like it. I love seeing new book covers. Good work! Oh, thank you so much! I am pretty proud of it too. Now I just need to get the physical book ready for my shelf. The day you get the physical book in your hand is a day to celebrate! I wish you luck. Congratulations on getting to this point! I await the next announcement. LOVE this cover, Allie. Had no idea you were an artist too. Congrats! Thanks! I like to dabble. I’m even more excited for you to see the changes I’ve made to the story! Thanks! I rather liked it too.